Fishers, Indiana is located in Hamilton County, northeast of Indianapolis. The town was platted in 1872. Originally it was known as Fisher’s Switch, although it was called Fishers Station as well. The town lies between the Geist Reservoir and the White River. When the Peru and Indianapolis Railroad came to the area in 1849, the town began to grow. The name was changed to Fishers in 1908. It has an estimated population of 90,127. One of the popular places of interest in this historic city is the farmer’s market in the Nickel Plate District. This is considered the cultural hub of the city with festivals and concerts as well as the farmer’s market. For outdoor lovers and history lovers, a trip to the Conner Prairie is a great way to learn about the history of the area by exploring the land. You can take a 1859 Balloon Voyage for an aerial view of Fishers. The museum covers three different 19th century periods. The original sits on land that belonged to the first settler, William Conner, who set up a trading post on the banks of the White River. If you enjoy outdoor exploring, Flat Fork Creek Park has a boardwalk that loops around the park. There are treehouses in the trees, and if you like to mountain bike, you can take advantage of the trails. If you like winter sledding, the park has a 60 feet hill for that purpose. Those who appreciate music will be happy with the Indianapolis Symphony Orchestra hosting Kroger Symphony on the Prairie during the summer months. If you appreciate wine, the family-owned Harmony Winery is a great way to experience the winemaking process. Group wine making sessions are available. The real estate in this thriving community includes modern contemporary single-family homes as well as older ranch styles and split-level homes. Contemporary townhomes are also available as new neighborhoods are developed. This is a quickly growing community that is known for its cleanliness and the number of activities it offers its residents. The homes have a good reputation, and the historic town is welcoming, to residents and businesses. 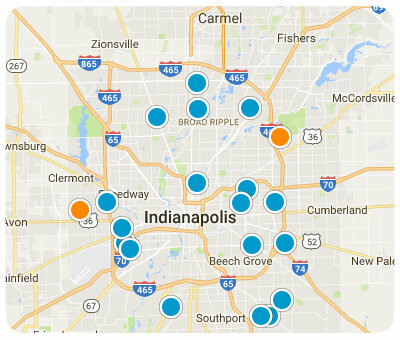 With access to all the amenities in the area, including those in Indianapolis, this is a must-consider destination for home buyers in the Indianapolis area. If you would like more information on homes for sale in Fishers, Indiana, please contact us today and allow us to assist you.